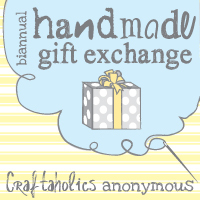 After hearing about it via Liz Noonan a few days ago, I signed up to participate in Craftaholics anonymous' Handmade Gift Exchange. It's my first time participating in it and I've been paired up with Haley who is the brains behind The Zen of Making blog. It's twice as lovely to be partnered up with someone so inspiring and creative and I'm looking forward to surprising her.